At age 7, Caelan informed us he was serious about starting youth road racing after spending the previous six months mountain biking at Lee Valley Youth Cycling Club. 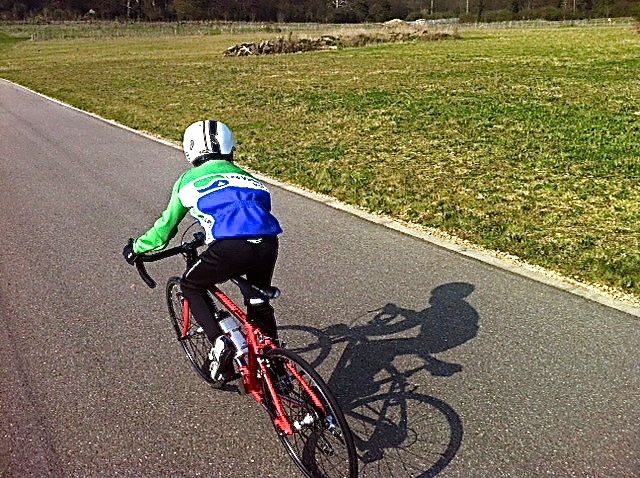 So mid-December 2011, we purchased an Islabikes Luath 24 after reading reviews of various 24 inch road racing bicycles on the market and speaking with club members. Other choices considered were the Moda brand as well as the Dawes Espoir 24 though immediately dismissed as near 1.5kg heavier with what appears to be zero road racing tyre compatability with its 507 rim. The Moda Minor was almost the winner, but there appeared to be no need for the double crankset with 18 speed especially as he would be lucky to use six or seven gears under British Cycling Category E gearing restrictions for racing. The Moda Minor was priced at about £480.00 while the Luath came in at £399.00 [though the Moda is slightly lighter in overall weight]. The appeal of buying direct also pushed the Luath in front in terms of any future problems and all enquiries were always helpful in terms of sizing etc. Please note that Islabikes generic sizing is good but I also used a growth chart to check if CJ was growing at a faster rate than average which he was being in the top 90% percentile. Subsequently an order was placed and a few days before Christmas the bike arrived well packed with very little to set up. The front wheel was placed in the forks, handlebar moved 45 degrees and pedals screwed in [marked left/right] to complete. The fact that the bike is also a cyclocross with cantilever brakes and dual brake levers was also a benefit in case he could not reach the levers on the drop position coming from a straight handle bar bike. One issue we had was that the gears were not set up correctly and during his first ride out the chain overshot the cassette into the rear wheel. Islabikes informed us that the bikes are setup and run through prior to delivery and the problem could have materialised during courier transit. We had the adjustments made at a local store and the invoice was forwarded to Islabikes as agreed and they refunded our costs. Good service and the resale of the bike was 75% of the initial cost when he moved onto his next steed being the 26. The perfect road/cyclocross bike for a budding racer to start their adventures and more information on youth road racing can be found here. Recommended and believe me 25+ mph can be achieved by this pocket rocket in the right hands and feet.